Amitayus, Buddha of long life, merit and wisdom. Amitayus is the principal Buddha for overcoming the power that death and ignorance have over us. With these removed we can fulfill our true human potential - the achievement of pure happiness. Amitayus' body is said to be akin to a ruby mountain, shining like a pure jewel. He is also associated with peacocks, his throne sometimes being painted with an array of these birds as its support. This theme is illustrated within the painting as an aura of peacock feathers. All prints from Sarasvati Arts provide a brief description of deity on the reverse along with the sacred letters Om, Ah and Hum marked at the Crown, Throat and Heart of the deity respectively. These symbolize the Buddha's body, Speech and Mind. 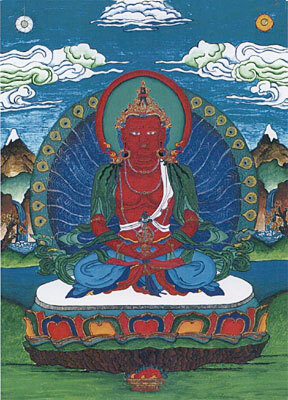 Within the Tibetan Tradition of Thangka Painting, the placing of these letters behind the image is seen to be the final stage of production, the moment of inviting the actual Buddha into the image.